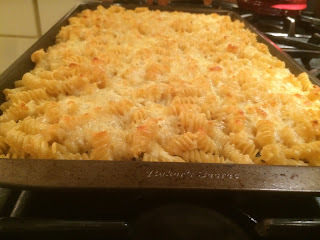 For all of you out there that prefer the crunch over the goo, this baking sheet version of macaroni and cheese will make you very happy. It’s also a whole lot easier than a traditional mac and cheese that calls for a roux. I’ve adapted it from a recipe I saw on one of my favorite food web sites, Food52. Preheat your oven to 475 while you boil a pound of pasta for six minutes, I recommend spirals as they provide the most surface area for maximum crunch. In a large bowl toss together 16 ounces of shredded sharp cheddar, an 1/8 of a teaspoon of cayenne pepper, and salt to taste. Drain the pasta and toss with the cheese mixture. Using a stick of butter like a crayon grease a large rimmed baking sheet then spread the pasta mixture. Pour 2/3 of a cup of milk evenly over the top along with 8 ounces of shredded extra sharp cheddar and bake uncovered for twenty minutes, serve immediately. I’m not sure which was better, the mac and cheese the first night or leftovers the next night on top of my burger…truly decadent.